It’s been years — generations — since anything has happened at that place in Mendocino where Lansing Street comes down the hill to meet Main. This level area above the bluffs overlooking the Bay has been empty since 1941 when the biggest hotel in town, the three-storied Occidental, was destroyed by fire and never rebuilt. Over the years, footpaths wound through the volunteer trees and wild blackberries, but the lot remained vacant and quiet, until recently. This last month, a huge noise filled the town for several days as trucks fitted with drilling rigs pierced the water table in preparation for a new structure. They did find the water they sought, but we have other evidence that water was right there a long time ago. Take a look at the pond in the picture. During the years our country was embroiled in the Civil War, a talented professional photographer named Carleton E. Watkins was taking pictures of the American West and the northern California coast. He set up his heavy large format camera here on the bluff with his back to Mendocino Bay, aiming his lens northeast up Lansing Street and captured this lovely vignette in 1863. In the foreground behind the picket fence you can see a little boathouse next to a small pond, an impoundment fed by one of the streams that used to flow down the south-facing slope where settlers had for the previous ten years been building the town of Mendocino. Maps from that era suggest this stream might be the very one that used to fill the Kelley House pond and make it attractive to geese. d lumber along a barely visible tramway to the shipping point on the west side of town. 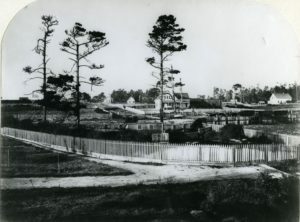 The large building in the middle of the image is the newly built house of John Chalfant, an employee of the Mendocino Lumber Company. He married Susan Hayes, the sister-in-law of Jerome Ford, the man who in 1852 oversaw the lumbering operations at the mill on Big River. The Chalfant House sat upon the site where the Occidental Hotel would later stand and is also the location of the recent water drilling operations. Some things have changed since this picture was taken! But not everything. Captain Lansing’s 1855 house, on the far right, is still there on Main Street across from the Presbyterian Church, although it now has a dormer and a front porch. Its water tower wouldn’t be built until the 1890s. The two buildings you see at the top of the hill also are present but gradually have been hidden over the many years since they were built. The one on the left with a steeple looks like a church and indeed it is Mendocino’s first non-denominational Christian house of worship, erected in 1857-58 near the corner of Lansing and Ukiah Streets, with its door facing the Bay. Next to it stands the first public schoolhouse, which opened its doors the year before this picture was taken. When the Presbyterians built their fine structure down on Main Street and the neighboring church building was no longer needed for services, this small school building was turned around 90 degrees, pushed across the yard and attached to the old church to create a larger space. For a short while it was a Methodist church. Over time, J.D. Johnson, the town’s prominent architect-contractor (and undertaker) creatively transformed these conjoined buildings. The main door, which had been moved to Lansing, got a false front. New structures were built next door down to the corner of Ukiah Street, and all of these were unified by him with a consistent architectural façade to become the Stauer Building. Many businesses have occupied these separate buildings that look like one structure. Besides Stauer’s general store, we know there have been a saloon, a justice court, a telegraph office, a barbershop, upstairs apartments, clothing and jewelry shops, bakeries and cafes, and so many others that a whole book could be written just about this building! But if you stand outdoors on the north side of the present-day Good Life Café and look up at the building, you can see the gabled roof of that original church. And if you have super powers that allow you to see through the second story walls, you’d see inside the church’s barrel-vaulted ceiling, one of only three such ceilings known around these parts. The others are found at the Masonic Lodge across the street, and at the Little River Improvement Club on Highway 1. 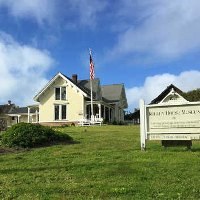 Returning to the now empty lot with the drilling rig down on Main Street, after the Chalfant family left Mendocino, William Norton bought their pretty home in 1874 and made improvements, turning it into a fine hotel he called the Norton House. It burned five years later. While he built another much larger hotel shortly thereafter at that same location, this earlier tragedy strangely foreshadowed the 1941 demise of its successor, the Occidental Hotel, which also burned in that same spot. Images like this one, which Carleton Watkins captured so long ago, are some of the earliest we have of the Mendocino Coast. They have been collected and published in beautiful books. While Kelley House Museum has several in its digital archives, we just received 14 large copies made from prints that used to hang in the Mendocino Lumber Company offices. Through the efforts of Bill Brazill, former high school photography teacher, artist, carpenter and stalwart supporter of the Kelley House for many years, and Braggadoon Signs and Graphics, a new permanent display of these Watkins photographs will be available in the museum soon. If you would like to support exhibits and acquisitions like the Carleton Watkins photographs, please consider making a donation to the Kelley House Museum during this season of giving. Visit kelleyhousemuseum.org to donate via PayPal or send your gift to P.O. Box 922 in Mendocino.